Soil solarization is a preventive, organic method of killing weeds before weed seeds even sprout. But the advice below is also meant for homeowners wishing to start a garden with a clean slate, reclaiming a patch of land where weeds have taken over, in such a way as to reduce to a minimum the hassle of future ​weed control. Want to transform a piece of land that has "gone to pot" into usable space? Then the method explained below may be the solution to your problems. First hack down the tall vegetation with a sickle, power trimmer, etc. But before doing so, make sure you know how to identify poison ivy, poison sumac, etc. If there are shrubs and trees present, cut them down with an ax or chainsaw. The ground needs to be smooth before you begin soil solarization (since you will be spreading plastic over it), so you will also have to remove the stumps left behind. If you are looking for a cheap way, use a tool called a "mattock." Dig and chop your way with the mattock under the root-ball to access and remove the taproot. Warning: this is hard work and may be feasible only for smaller stumps. 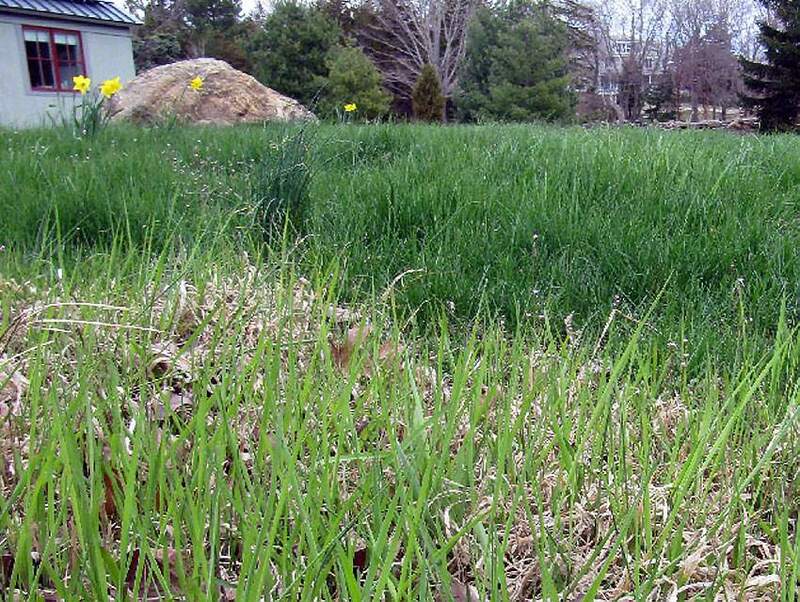 Run a mower over the land to reduce the weeds' height further. Now that all the weeds are as short as possible and the stumps have been removed, rent a large tiller to uproot all the weeds. Since this plot of ground is uncultivated soil, you will need a tiller that has some power: Do not undertake this task with a small garden cultivator! Allow the tiller's tines to dig deep enough into the ground to loosen the weeds, so they can be removed—roots and all, if possible. Now use a steel rake on the area that you have just tilled, wielding it like a fine-toothed comb to remove the majority of the uprooted weeds. Next, rake the area again, this time with the object of evening out the soil as best you can and removing stones, twigs, etc. A final preparation for soil solarization, our organic weed control method, will require the use of a garden hose. According to the University of Idaho Extension (UIE), you should moisten the area that you have just raked to "conduct and hold heat, to stimulate weed seed germination, and to prevent dormancy of below-ground vegetative plant parts." Perhaps you are wondering at this point, "Why do I need soil solarization? Why can't I just lay landscape fabric at this point, punch some holes in it, plant my new plants and then cover with mulch?" Well, the reason you can't is that your job of killing weeds has only just begun. Weed seeds that you can't even see are lurking beneath the surface, just waiting to sprout. If the weeds are vigorous enough, they will find a way back to the light (remember, the integrity of the landscape fabric will be compromised when you punch holes in it for your new plants). So you need to kill those seeds before you proceed with laying landscape fabric. And that is a job for soil solarization. Cover the raked, moistened area with a clear polyethylene sheet. The edges of the sheet can be held down by cinder blocks to keep the plastic from blowing away. If the raking mentioned above was done diligently enough, there will be no sharp objects sticking up to puncture the plastic. The sheet of clear plastic can be anything from 1 to 6 mil. in thickness. In the Northern hemisphere, the best time for soil solarization is June and July, when the sun is at its peak. UIE recommends keeping the sheet of clear plastic tightly stretched out over the area for about 2 months. During that time, the sun will be killing weeds for you—"cooking" them before they have a chance to sprout. Plant pathogens will be killed, to boot. Now you truly have a "clean slate" with which to work. Remove the plastic and lay down landscape fabric. You should try to use one of the stronger types of landscape fabric if possible, just in case—in spite of your best efforts—any sharp objects remain in the ground (which would puncture the landscape fabric). When you cut slits in the landscape fabric and install new plants, be careful that you don't get dirt all over the landscape fabric. After all, why prepare a home for airborne seeds? Sure, you will be applying mulch. But airborne weed seeds can wend their way through mulch particles. If they find dirt, then they are "weeds waiting to happen." Of course, if you use an organic mulch (such as a bark mulch), it will eventually decompose anyhow, becoming fertile ground for weeds. What can you do? Well, you had better keep new weeds pulled, faithfully. Vigorous roots pushing downwards can stress landscape fabric and breakthrough. On the bright side, these weeds should be relatively easy to pull, since mulch is a lot looser than dirt, and weed roots will not become impossibly entrenched. Speaking of mulch, applying a layer of it over your landscape fabric is the final step in this project. Do not pile up mulch heavily around newly planted trees or shrubs; it invites diseases. When old mulch decomposes it needs to be removed and replaced with new mulch.